1. Operator of this promotion is Eurotramp-Trampoline Kurt Hack GmbH, Zeller Straße 17/1, 73235 Weilheim/Teck, Germany. 2. 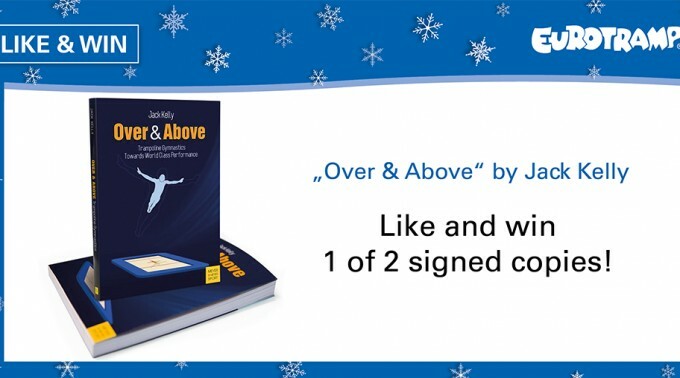 You can win 1 of 2 signed copies of the trampoline book "Over & Above" by Jack Kelly. 3. To participate in the contest you have to like the Facebook post „Over & Above" by Jack Kelly LIKE & WIN. Contest begins on 6 December 2016. Participation is possible until 11 December 2016 12 p.m. Winner will be picked at random using the „Glücksfee“ of Fanpage-Karma (www.fanpagekarma.com/facebook-promotion). With an active „Like“ users agree to these terms and conditions. 4. Eurotramp will announce the winner beneath the original contest post on the Eurotramp Facebook page. After the announcement the winners are asked to send their addresses via Facebook messages to www.facebook.com/eurotramptrampoline within 7 days, the winner has to use the Facebook account with which he liked the original contest post. Otherwise winners will no longer be entitled to redeem the prize. The prize will be sent via post. 5. Participation in the contest is free and independent of the acquisition of goods or services. The prize is neither exchangable nor transferable. The issue of a credit note or a payout of prizes in cash is not possible. 6. Eurotramp employees and their relatives are excluded from the participation of the contest. 7. This contest is not linked to Facebook in any way. Please send your questions, comments or complaints regarding this contest directly to marketing@eurotramp.com. 8. All data collected through the contest will be treated accordingly to the rules of the German Federal Data Protection Act, the Remote Services Statute and the Telecommunication Services Act. The data collected through participation in the contest were collected and saved in order to conduct the contest, not for advertising purposes. Use of collected data can be revoked at any time for free via e-mail to marketing@eurotramp.com. 9. Eurotramp reserves the right to stop the contest at any time without preannouncement. Eurotramp will especially use this possibility if a proper conduction of the contest cannot be guaranteed for technical or legal reasons. 10. There is no right of appeal. The contest is subjected to the laws of the Federal Republic of Germany exclusively. Conditions of Facebook contest "Sleeping mask Like & Win!" 1. Operator of this contest is Eurotramp-Trampoline Kurt Hack GmbH, Zeller Straße 17/1, 73235 Weilheim/Teck, Germany. 2. You can win one of three sleeping masks from the Eurotramp merchandise shop www.eurotramp-merchandise.com. 3. To participate in the contest you have to like the Facebook post „Sleeping mask Like & Win“. Contest begins on 2 August 2016. Participation is possible until 5 August 2016 12:00. Winner will be picked at random using the „Glücksfee“ of Fanpage-Karma (www.fanpagekarma.com/facebook-promotion). With an active „Like“ users agree to these terms and conditions. 4. Eurotramp will announce the winner beneath the original contest post on the Eurotramp Facebook page. After the announcement the winners are asked to send their addresses via Facebook messages to www.facebook.com/eurotramptrampoline within 14 days, the winner has to use the Facebook account with which he liked the original contest post. Otherwise winners will no longer be entitled to redeem the prize. The prize will be sent via post (UPS). 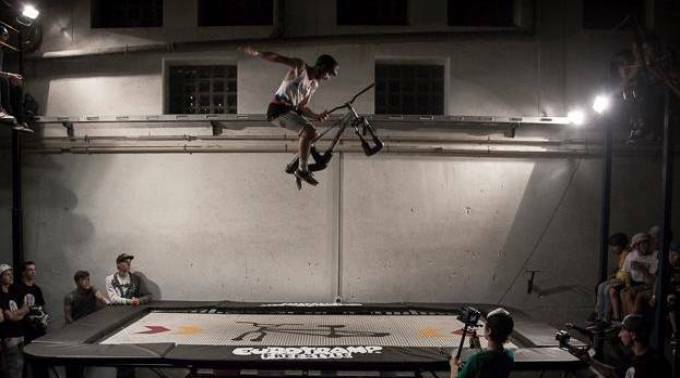 Eurotramp, worldwide leading company on trampolines for professional competition, promotes the new mat-black product line “Freestyle”, targeting the disciplines Snowboard, Freeski, Wakeboard, BMX/Trampbike, Skateboard, Freerunning and Parkour. The Eurotramp Freestyle-Trampolines will be individually customized for the needs of each Freestyle-discipline. They will be offered in additional to classical large equipment, for ex. the Ground Trampoline that is also suitable for outdoor use. Each performance level and range of use will be supplied with an appropriate jumping bed. All Eurotramp-Trampolines are 100% Made in Germany. The support of RadQuartier, Freestyle Academies in Laax and Stuttgart, Sesitec and BagJump makes the project even stronger. The Trampbike world champion of 2014 Nicolas Thiem, Wakeboarder Nico von Lerchenfeld and Red Bull Snowboarder Anna Gasser and Tim-Kevin Ravnjak already train for years on Eurotramp equipment. Freestyle-Trampolines are ideal as a training equipment and to improve the flexibility, body control, strength, endurance and jumping power. Many tricks and styles can be practiced several of times without any problem. In seasonal Freestyle sports, the training can be practiced at any time of the year.